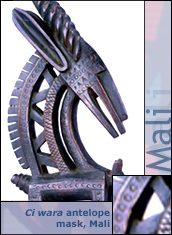 Mali: From Timbuktu to Washington, D.C.
ali has been known since ancient times as the location of the Mali Empire and the fabled city of learning, Timbuktu. Trade in gold and salt made Timbuktu a center of the trans-Saharan trade. From the 12th century, scholars from throughout West Africa gathered at the Sankoré mosque to study the Koran, literature, history, and law. Timbuktu and many of the other great cities of landlocked Mali are along the Niger River, a thoroughfare for commerce and travelers. Festival visitors will learn of the Empires of Ghana, Mali, and Songhai, celebrated in the songs of griots (oral historians). Visitors will see examples of sudanic adobe architecture under construction, hear music and learn the dances of the Dogon, Bambara, Fulani, and Bozo peoples, see the jewelry and tents of the nomadic Touareg people, taste the cuisines of Mali, and learn how mudcloth is made from hand-spun and hand-woven cotton. In the bicentennial year of the Louisiana Purchase, visitors also will learn how Malians contributed to the culture and development of the United States.